Léon Beyer is one of Alsace’s great names in wine, famously sticking over the years to a range of truly dry wines. At Léon Beyer, only the Vendages Tardives and Séléction de Grains Nobles are sweet wines, and even then, not amongst Alsace’s sweetest in their respective ranges. The original 1983 Gewürztraminer SGN bottling carried the label that is shown here (I bought a case of these bottles in Alsace soon after release) but today both the wine’s name and label have been modified (the decision was made to add the word “Quintessence” to the SGNs when Beyer began using this term regularly as of 1998). Semantics aside, there have been only three such wines made, in 1983, 1998 and 2005. The 1983 Quintessence is dark golden yellow in color, offering aromas of ripe peach, crystallized ginger, dried papaya, almond paste, hazelnut, plus a whiff of Benedictine. Still bright after all these years, the 1983 is loaded with luscious sweet tropical fruit and spicy flavors that are clean and ripe. The long smooth finish hints at white chocolate and aromatic herbs. Not especially sweet, with just enough acidity to keep it relatively light and lively, the 1983 comes across as an especially airy, easygoing Gewürtz SGN that is far removed from some opulent behemoths characterizing the production of other Alsatian producers. Lovers of more decadently styled sweet Gewürzes might not be as impressed by Beyer’s more dainty, delicate version, but that is a simply a case of different strokes for different folks. 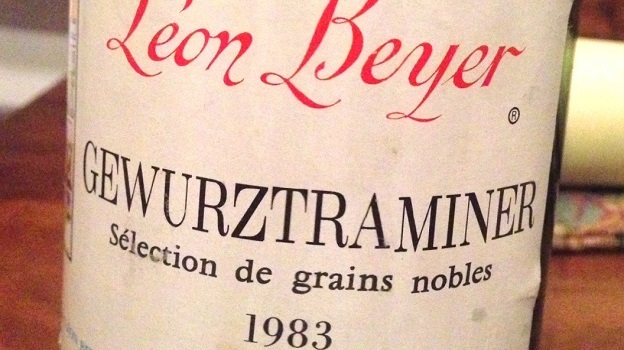 The1983 SGN was briefly re-released most recently in 1999 in honor of the new millennium, as at Léon Beyer maintains copious stocks that are set aside for resale over the years. For those interested in the numbers, the 1983 clocks in at 115 g/l of residual sugar, with 4.5 g/l in total acidity. 93/Drinking window: 2015-2020.